Brief Synopsis – After escaping the first attack of demons in a cabin in the woods, a man must now join forces with 4 new strangers in order to stop the evil from escaping the area. My Take on it – Once again I have been challenged with watching another film in this series. The original film was given to me to watch during the previous Movies From the Hat that I did last year and this time it was suggested by David Brook of Blueprint Review for this month’s Movie of the Month on The LAMB. AS someone who isn’t a fan of any type of horror film, even comedy horror like this film, I actually can’t say that it was my cup of tea. The fact that this film doesn’t take itself very seriously also helps make it a bit more fun because they are able to make some of the story completely insane. 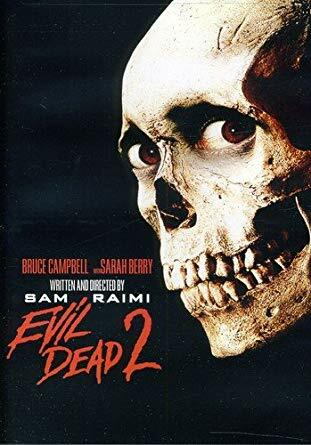 Bruce Campbell is fun in the lead here because he gets the part just right with the balance between a character who is insane and one who is in control of his faculties. He gets a bit over the top here which slightly makes things even crazier. The plot itself is quite simplistic and in some ways silly but as a comedy-horror film, it still meets the expectations for this kind of genre. The film’s special effects are quite cheesy and look terrible which adds to the unrealistic aspects of this story. The chainsaw-hand idea is a fun one and works despite it being completely impractical. They leave things in this story in an ambiguous way that opens up some possibilities for the next film in the series which could theoretically be interesting. I can completely understand how this kind of film could gain cult status despite the fact that it isn’t really the kind of film that I enjoy. Bottom Line – Film that doesn’t take itself seriously at all which allows them to have fun making things completely insane. Campbell is fun in the lead but he gets much to over the top too often. The plot itself is quite silly and simplistic, but still manages to do what it is meant to do as a comedy-horror. The special effects are terrible and cheesy and makes things even more unrealistic the whole way through. I liked the chainsaw-hand idea despite its impracticality and the way that they leave things towards the end opens up so many possibilities that could theoretically work. Definitely understand how a film like this could get cult status even though it is far from being the kind of film I could truly enjoy.